Curiosity’s calibration target, imaged with MAHLI on March 9, 2017 (mission sol 1632). Credit: NASA/JPL-Caltech/MSSS. On March 9, 2017, NASA’s Curiosity rover took this picture with its turret-mounted MAHLI camera of the calibration target installed near the “shoulder” of its robotic arm. In addition to color chips and a metric line graph, the target also includes a U.S. coin: a 1909 Lincoln penny, adhered heads-up. “When a geologist takes pictures of rock outcrops she is studying, she wants an object of known scale in the photographs,” said MAHLI Principal Investigator Ken Edgett of Malin Space Science Systems in San Diego, which designed and built the rover’s cameras. (Source) “If it is a whole cliff face, she’ll ask a person to stand in the shot. If it is a view from a meter or so away, she might use a rock hammer. If it is a close-up, as the MAHLI can take, she might pull something small out of her pocket. Like a penny. The penny on Curiosity is a 1909 “VDB” wheat cent. 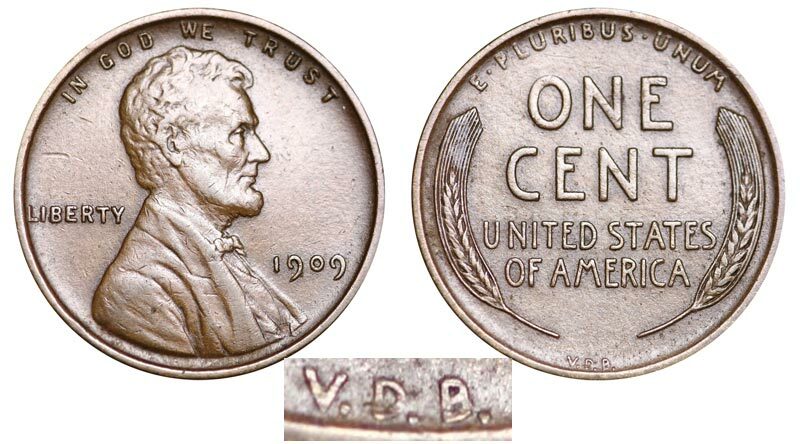 1909 is the first year Abraham Lincoln was featured on the coin, in honor of the 100-year anniversary of his birth, and VDB are the initials of the designer—Victor David Brenner—which are engraved on the opposite side in small letters below two curving shafts of wheat. 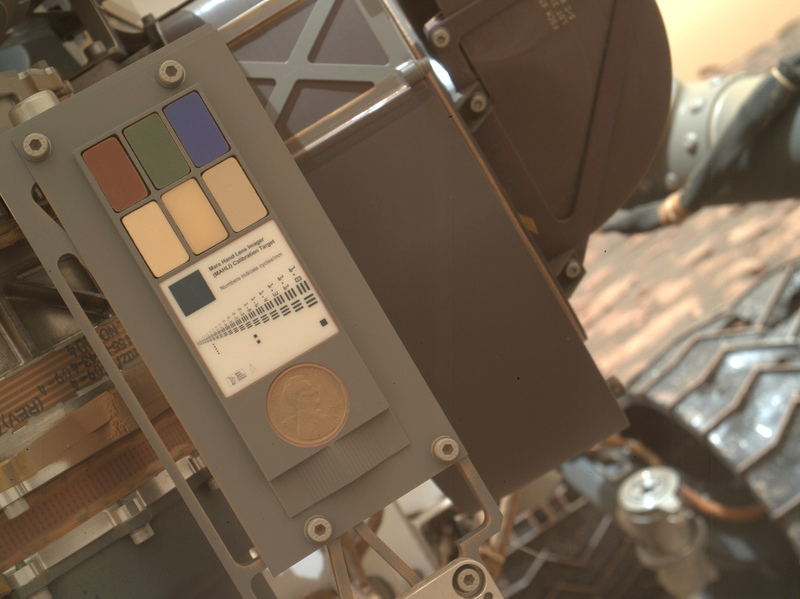 Detail of the 1909 VDB penny on Curiosity’s calibration panel. The lines below the coin are a stepped depth calibration target. Curiously enough (see what I did there?) there was a bit of a controversy around the coins themselves when they were released over a century ago. Brenner, a talented engraver and Lithuanian immigrant, had designed the now-famous sculpted portrait of Lincoln two years prior to his commission to create the new one-cent design. On the production die he included his initials, which some people criticized as self-serving and conspicuous. In addition some people didn’t find the stylized wheat motifs on the “tail” of the coin scientifically accurate enough…and many Southerners simply disliked a coin commemorating Lincoln. The U.S. Mint subsequently removed the initials on later 1909 coins but eventually replaced them in smaller letters in 1918. 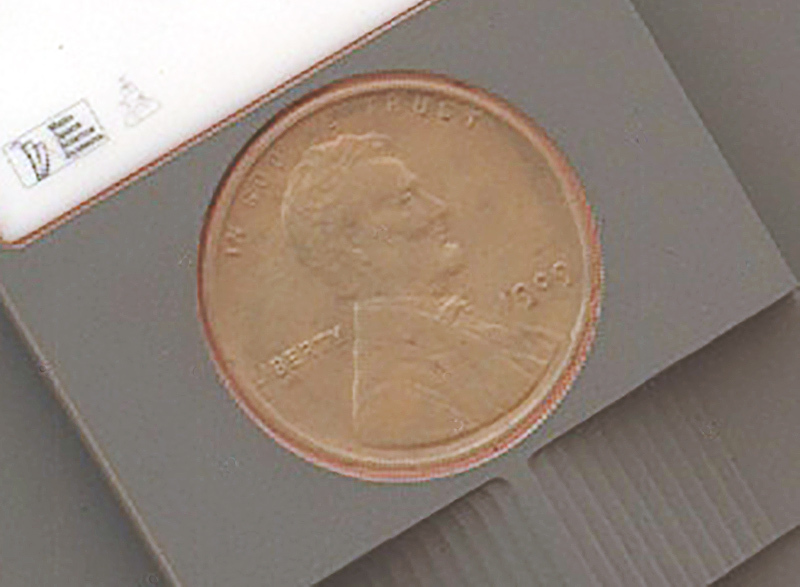 Brenner’s initials remain on U.S. pennies today, just below Lincoln’s right shoulder. Read more here. These days the use of pennies (and coins in general) may be in decline but still many people are familiar with the size and color of a one-cent coin, and that’s also part of the reason why it was included on Curiosity. Now there’s a penny for your thoughts! Learn more about Curiosity’s historic one-cent coin here.